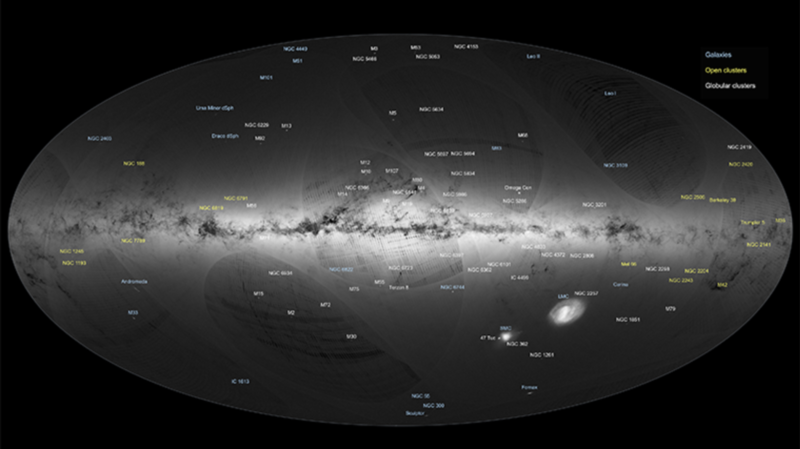 Today, September 14, the European Space Agency (ESA) released the first map of the Milky Way to be drawn by Gaia, the space-based observatory at the heart of an ambitious astronomy mission to map our galaxy with an extremely high level of precision. "The Gaia mission was always considered the dream of any astronomer," said Alvaro Giménez, the director of science for ESA, at the map's unveiling at the European Space Astronomy Center (ESAC) in Villanueva de la Cañada, Madrid, Spain. The Gaia telescope is so powerful that from Earth it could see a coin placed on the surface of the Moon. Such precision is necessary to achieve Gaia's goal of building the most accurate 3D sky map ever attempted. So far, more than 1 billion stars have been surveyed 70 times over in order to place them on the map precisely. The mechanism for measuring a star's distance has long been known by scientists, said Fred Jansen, the mission manager of Gaia. "You use the Sun-Earth distance as a baseline. The Earth moves around the Sun, and that means for stars at a finite distance, if you see them against background stars, they actually describe a small circle in the sky," Jansen said at the unveiling. Because stars themselves are moving as well—and doing so in three dimensions—there is a second effect at work: their movement away from us (their velocity). Combining the effects produces a sort of corkscrew effect. "We measure a number of times to be able to disentangle the effects of motion through space, and this is what Gaia is really good at," said Jansen. To do its job, Gaia maintains an exact, continuous spin and careful timing. Its position in space—about 932,000 miles from Earth, co-orbiting with us around the Sun—is tracked using ground-based telescopes, and its precise location must be known within 100 meters. The spacecraft uses large aperture, high-quality optics of Hubble caliber, with a billion-pixel focal plane camera. It observes simultaneously with two telescopes separated by an extremely stable angle. The angle is measured by an internal device called an interferometer, said Jansen. On the map released today, brighter areas mean more stars and darker areas mean fewer. The Galactic Plane—a 1000-light-years-thick band of the spiral-shaped Milky Way where the vast majority of stars are located—runs horizontally across the center of the map. The dark threads running across are clouds of interstellar dusts and gases. In our galactic neighborhood, galaxies are labeled in blue, open clusters in yellow, and globular clusters in white. (Our own pale blue dot is far too small to be seen.) The two bright white spots in the lower-right quadrant of the map are dwarf galaxies that orbit our own. They are called the Large and Small Magellanic Clouds. Andromeda appears at the lower left. ESA has been making maps of space, from space, for almost 30 years, starting with the Hipparcos (High Precision Parallax Collecting Satellite) spacecraft that was launched in 1989. Gaia is a significant leap over Hipparcos, as might be expected in the decades that have elapsed. Whereas the older spacecraft could observe 120,000 objects, Gaia can see 1 billion. Hipparcos could spot 50 objects in our own solar system; Gaia can see about 250,000. Moreover, the raw numbers of measurements being taken by Gaia are staggering: 490 billion astrometric measurements (i.e. where objects are and how they are moving), 118 billion photometric measurements (i.e. light and light sources), and 10 billion spectroscopic measurements (i.e. electromagnetic radiation to identify materials). The Gaia dataset, in other words, is mind-boggling in scope—on the order of 40 gigabytes per day, which must be transmitted at high speeds back to Earth. This is particularly challenging, as a spinning spacecraft makes a direct beam impossible. Rather than use a parabolic dish, engineers had to create a special antenna to maintain transmissions. Gaia is one of a series of ESA observation missions to determine the composition, evolution, origin, behavior, and destination of the universe. Other such missions include LISA Pathfinder, its ongoing, experimental gravitational waves mission; and the Herschel Space Observatory, whose mission ended in 2013, but whose dataset—with such results as the recently released images of stellar nurseries—continues to astound scientists and the public alike. Other ESA missions include Rosetta and its famous (and recently found) lander, Philae; and ExoMars, which will arrive at its namesake destination on October 19.